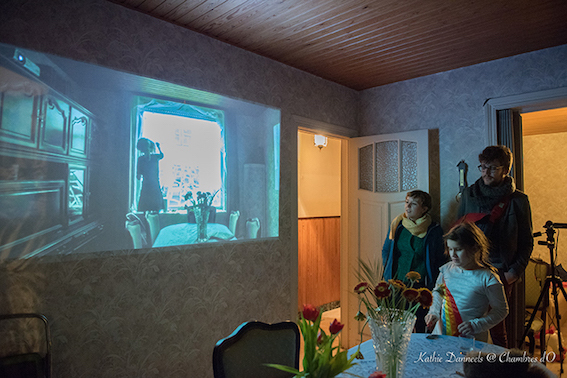 “Chambre d’0” is a festival parcours, taking place in several private living rooms, inhabitants open their homes and artists show work/performances/theatre, … visitors can enter in their living rooms. 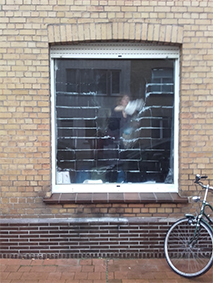 A window is the border, the barrier between inside and outside, between the private and the public space. 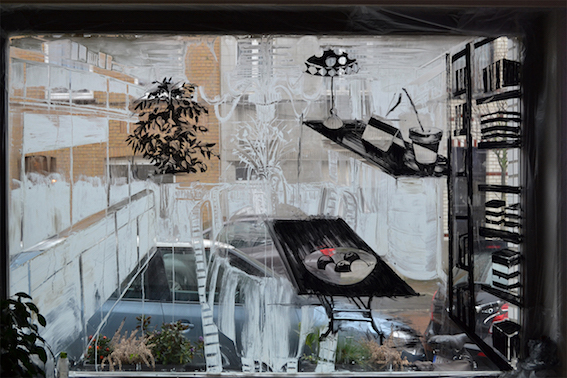 You look through a window to what happens outside. 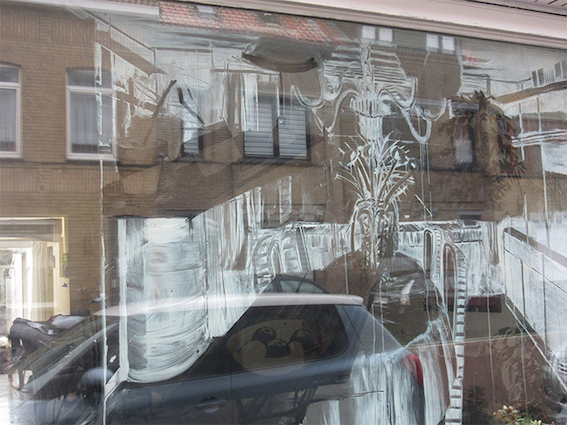 Or, you are curious to know what’s inside. 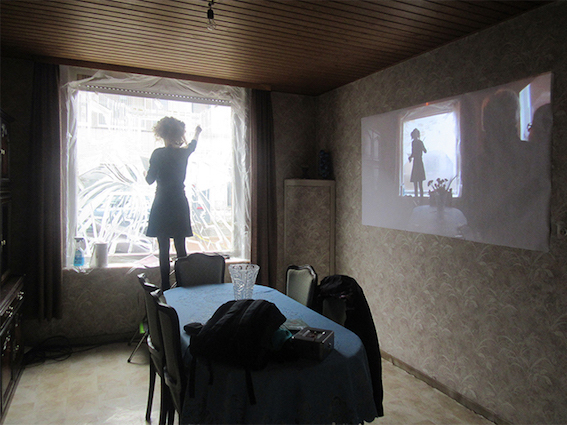 The surroundings and the house you live in, determines your vision on the world. 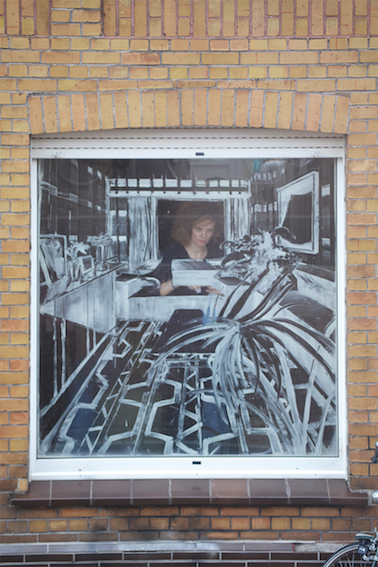 Often we want to keep the look of the other outside, and we screen us off with shutters or curtains. 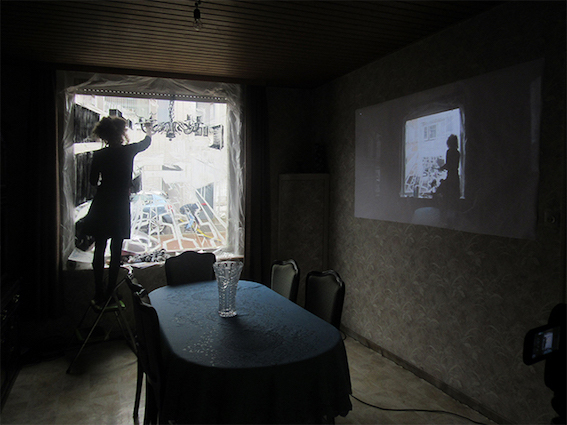 And yet, we would also show who we are. 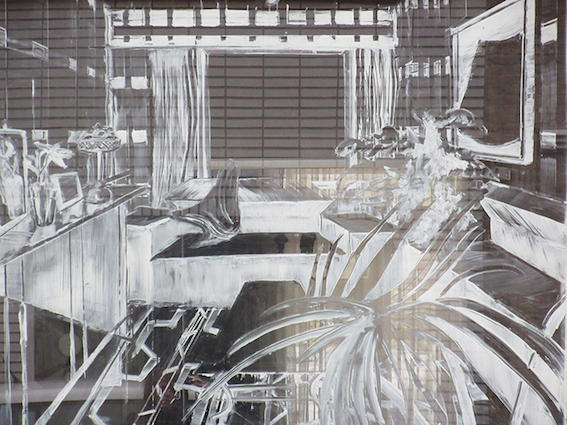 The shutters or drapes are as mirrors of who we are. 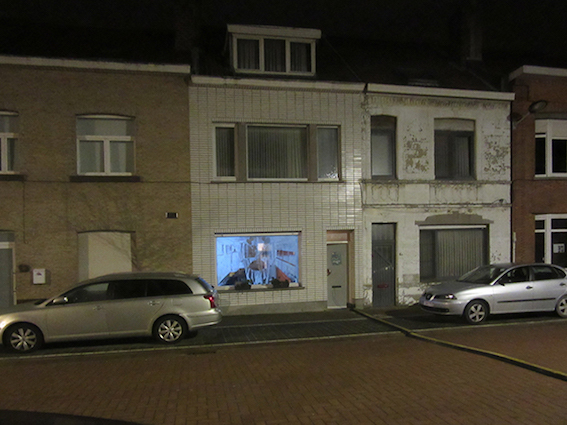 The installation existed of two private houses opposite each other, with the street in between them. 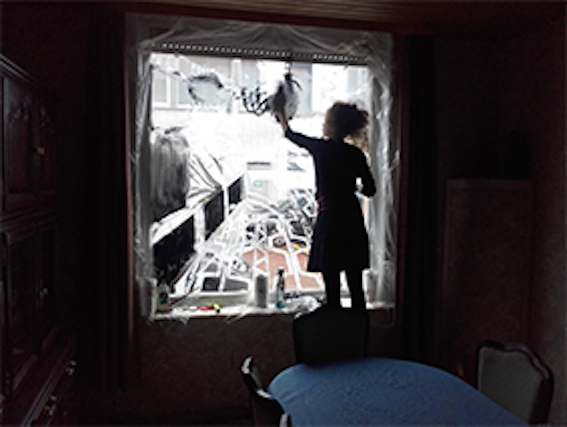 Through the windows, the inhabitants can look, from their living room, too the living room of their neighbours, opposite of the street. 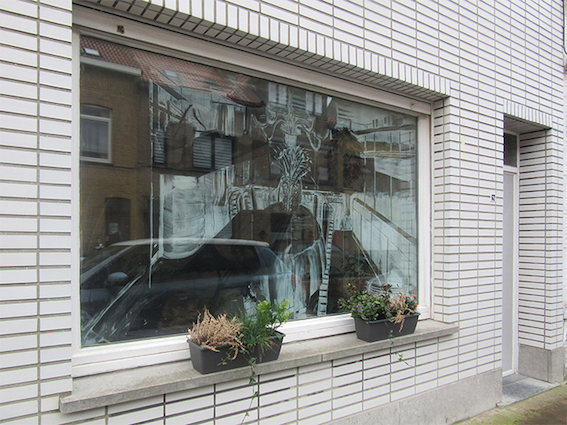 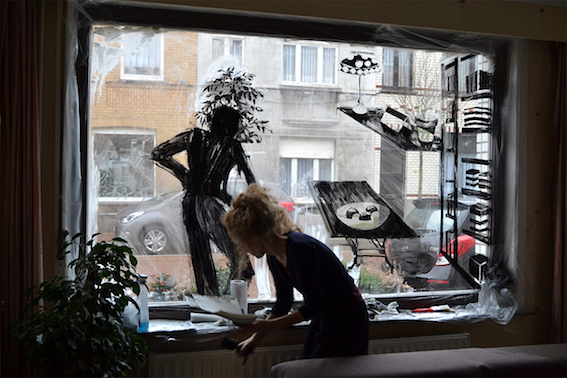 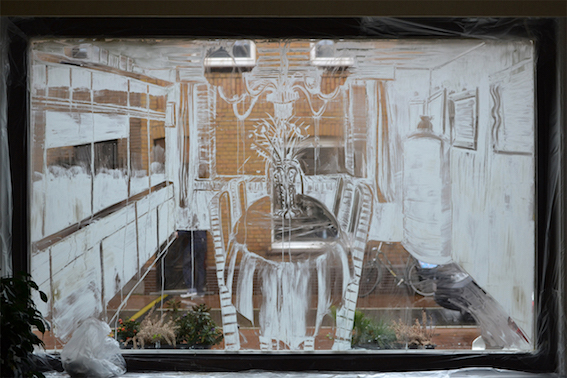 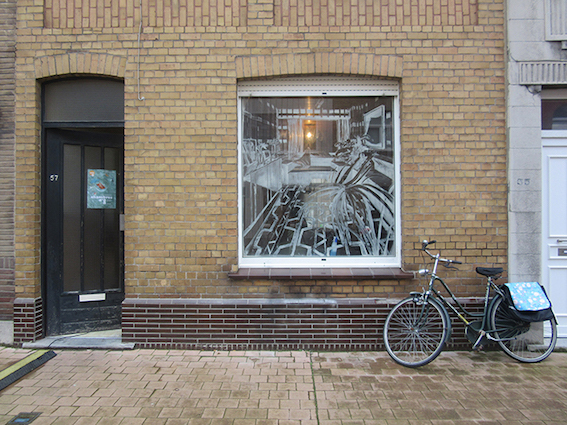 During 3 days I was drawing alternately on the windows of the living rooms of both windows. 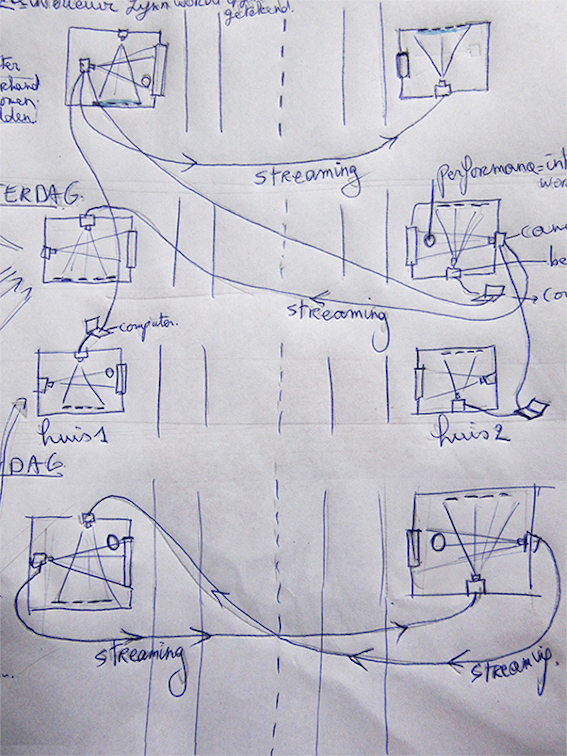 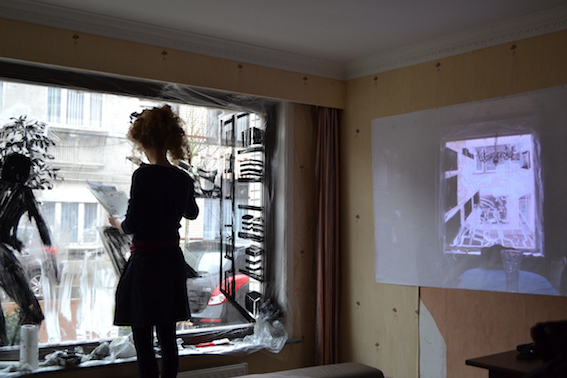 In ‘living room 1’ is a camera installed, this camera is filming the drawing. 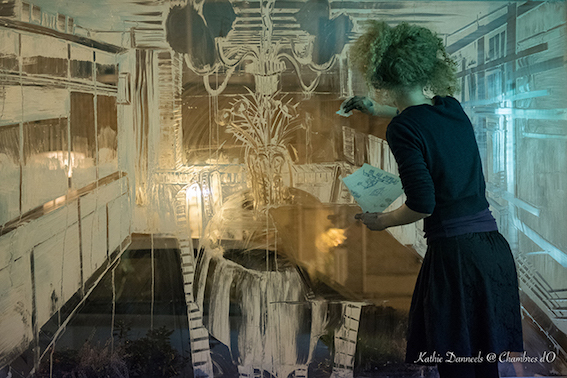 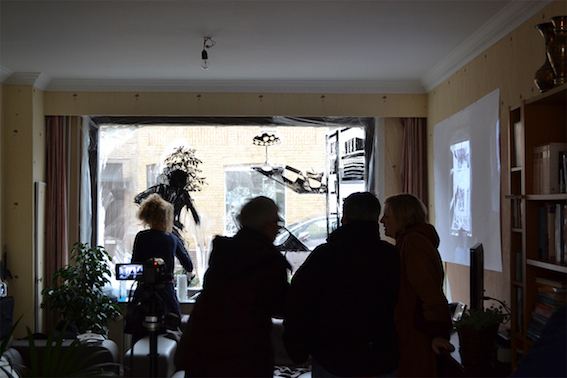 The video recorded different layers: the visitors, the interior, the window, the drawing, the background, the passers-by, the opposite window of the neighbours. 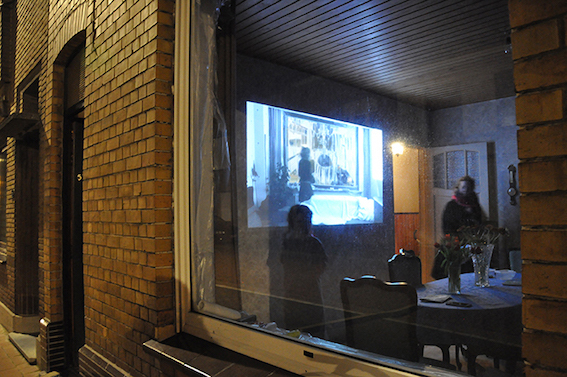 This video (made in ‘living room 1’) was life shown and projected in ‘living room 2’. 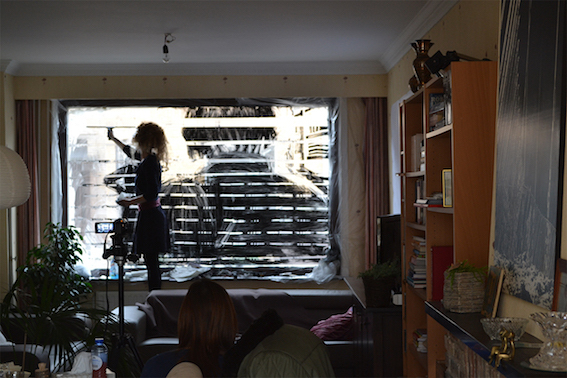 In ‘living room 2’ another camera was filming. 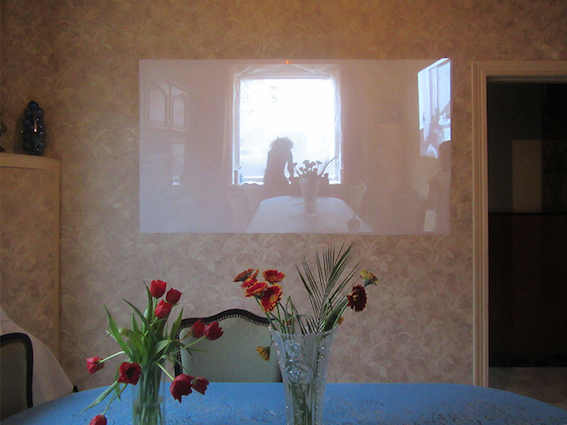 This video was life shown and projected in ‘living room 1’. 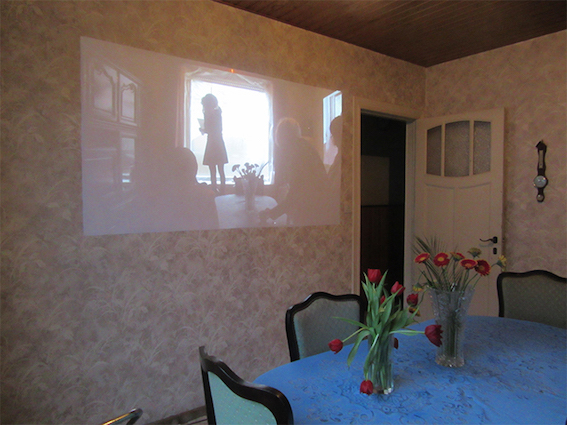 As a visitor, you could enter the living room. 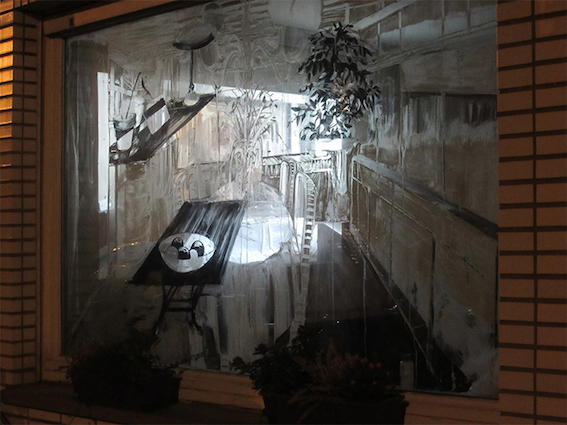 You could see the drawing performance on the window and, at the same time, next to this, the projection of the window on the opposite of the street. 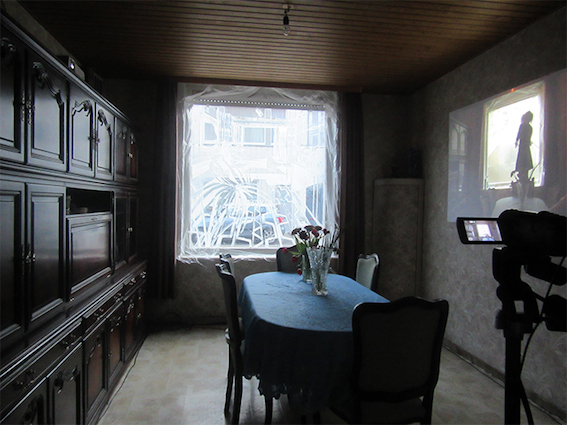 On specific times pre-recorded video where shown.